The best known of circus pioneer P.T. 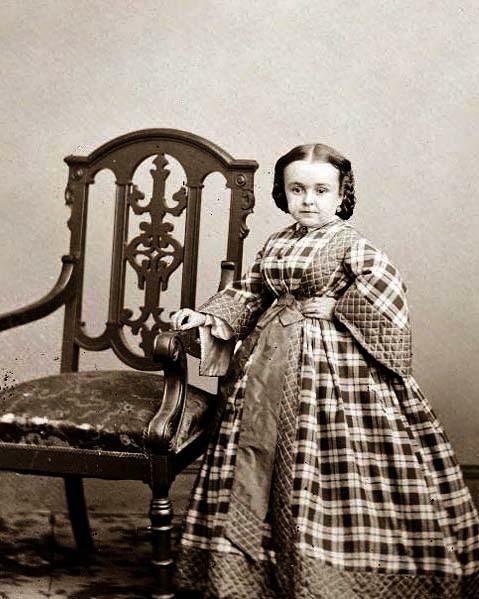 Barnum‘s performers was Charles Sherwood Stratton (1838-1883), also known as General Tom Thumb. Stratton weighed 9 lbs. 8 oz. at birth, a bouncing baby boy for the time, but stopped growing at six months. 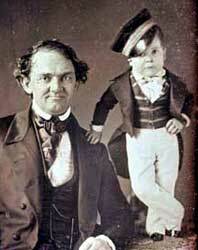 When Barnum discovered him at the age of five, Stratton weighed only 15 lbs. and was 25 inches tall. Barnum wasted no time signing up the boy as a sideshow attraction. His parents happily rented out their child for $7 a week plus room, board, and traveling expenses. Barnum installed the Strattons in a fancy New York City apartment above his museum of human curiosities. Barnum then began transforming Little Charlie into an international celebrity he christened “General Tom Thumb,” recalling the tiny fictional knight of King Arthur’s round table. The knight was so small, he rode a mouse and battled spiders. 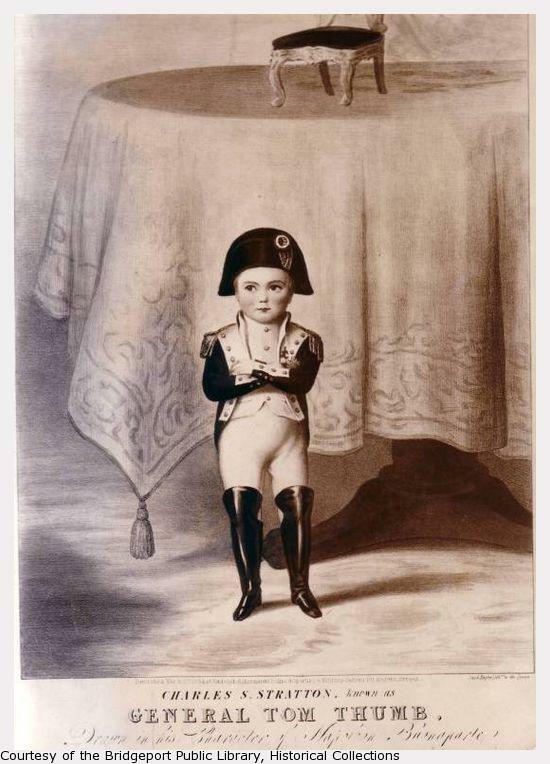 1844 stereograph depicting General Tom Thumb as Napoleon. Although "Tom" was really six at the time, P.T. Barnum promoted him as a 13-year-old. In 1844, Barnum took his young protege on a much-publicised European tour debut. Tom Thumb was a huge sensation, appearing before the crowned heads of Europe and visiting Queen Victoria not once, but twice. Audiences were enchanted with the man-boy whose charm combined innocence with pomposity. Over time, Tom made so many visits to royalty that Barnum had a special carriage built for him. Years went by and the money from Tom Thumb’s tours made him a rich man. “The Man in Miniature” moved to a specially-designed mansion for him and his parents in his hometown of Bridgeport, Connecticut. It was said that, by the age of 19, Tom had been kissed by a million and a half girls.Soon, though, the United States was plunged into the Civil War and Tom wanted more than just kisses from strangers. He began looking for a wife. He found her in the diminutive form of another little person, the charming and very beautiful Lavinia Warren. On February 10, 1863, the two were married at Grace Episcopal Church in New York City. The wedding was front page news. Billed as “the fairy wedding,” it was the social event of the season. People clamored for invitations, yet only two thousand people were invited. As Tom and Lavinia made their way up the center aisle to the altar, only guests seated along the aisle could see them. Once they arrived at the chancel, women stood on tiptoes and a few climbed on chairs to witness the ceremony. Afterwards, P.T. Barnum staged a reception for the newlyweds at the Metropolitan Hotel. Barnum charged $75 a ticket. Although there was a demand for 15,000 tickets, only 5,000 were sold. At the reception, the Strattons stood on a piano to receive their guests. Later on their honeymoon, they traveled to Washington, D.C., to the White House, where President Lincoln gave them a fancy party. In the course of the evening, the president told General Tom Thumb that he had put him completely in the shade, as he [the General] was now the center of all attention. (1) Fleming, Candace. The Great and Only Barnum: The Tremendous, Stupendous Life of Showman P.T. Barnum. New York: Schwartz & Wade Books, 2009.